The Catalogue of paintings in the National Gallery, London lists the named painters of the collection of the National Gallery, London, as they were catalogued in 2010 by the Public Catalogue Foundation. The collection contains roughly 2,300 paintings by 750 artists, and only attributed artists are listed here. Painters with more than twenty works in the collection are Jean-Baptiste-Camille Corot, Carlo Crivelli, Anthony van Dyck, Francesco Guardi, Rembrandt van Rijn, Peter Paul Rubens, Jacob van Ruisdael, and David Teniers II. The only women artists with works in the collection are Marie Blancour, Rosa Bonheur, Rosalba Giovanna Carriera, Catharina van Hemessen, Judith Leyster, Rachel Ruysch, and Elisabeth Louise Vigée-LeBrun. 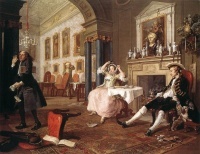 The only British artists with works in the collection are William Boxall, John Constable, Thomas Gainsborough, William Hogarth, John Hoppner, John Callcott Horsley, John Jackson, Thomas Jones, Cornelis Janssens van Ceulen, Thomas Lawrence, John Linnell, Henry Raeburn, Joshua Reynolds, Martin Archer Shee, George Stubbs, Joseph Mallord William Turner, Richard Wilson, and Joseph Wright of Derby. However, because of the historical links between the National Gallery and its offshoot in the 19th century, Tate Britain, the National has in the past transferred and recalled works by British artists to and from its collection. Unless indicated otherwise, the text in this article is either based on Wikipedia article "Catalogue of paintings in the National Gallery, London" or another language Wikipedia page thereof used under the terms of the GNU Free Documentation License; or on original research by Jahsonic and friends. See Art and Popular Culture's copyright notice. This page was last modified 15:30, 19 March 2018.